The Feast of St. Nicholas (also known as Sinterklaas) takes place on December 6th to commemorate the death of St. Nicholas of Myra. Speculaas are traditionally served on this day and throughout the Christmas season. There are two types of Speculaas, the thin and crispy ones that we buy which are usually in a windmill or St. Nicholas shape. And then there is the more soft and chewy Speculaas that I have given a recipe for here. 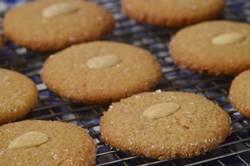 Both types of these spicy cookies have that delicious buttery sweet almond flavor. This Speculaas recipe is adapted from a wonderful book called Windmills in my Oven by Gaitri Pagrach-Chandra in which she explains both the history and the making of Speculaas. She tells us that it is unclear whether the name 'Speculaas' comes from 'speculum' or 'speculator'. That is because 'speculum' means "mirror" and some forms of this cookie are made from a mould so the cookie is the 'mirror image' of the mould itself. And 'speculator' means "'he who sees all', in this case St. Nicholas of Myra. Either way, Speculaas have been made for centuries and at one time both the mould itself and the biscuit were painstakingly made by hand. Now, this recipe calls for ground almonds. You can buy ground almonds at health food stores and at many large grocery stores either on the baking isle or in the health food section. If you cannot find it you can make your own by taking 1/2 cup of blanched almonds (along with the flour in the recipe) and processing these two ingredients in your food processor until finely ground. Just make sure not to over process this mixture as it needs to be finely ground, not a paste. Speculaas: In a bowl, whisk the flour with the ground almonds, baking powder, salt, ground spices, and lemon zest. In the bowl of your electric stand mixer, fitted with the paddle attachment (or with a hand mixer), beat the butter and sugar until light and fluffy. Scrape down the sides and bottom of your bowl as needed. Beat in the egg until well combined. Add the flour mixture and beat until combined. Place the batter in a bowl, cover with plastic wrap, and refrigerate until firm (at least one hour, or even overnight). Preheat your oven to 350 degrees F (180 degrees C) and place the oven rack in the middle of the oven. Line two baking sheets with parchment paper. Remove the chilled dough from the refrigerator and form into 1 inch balls (2.5 cm) (about 20 grams of batter for each ball). Place the balls of dough on the prepared cookie sheet, spacing about 2 inches (5 cm) apart. Then, using the bottom of a glass dipped in sugar (can also use a cookie stamp), flatten each ball of dough into a 2 inch (5 cm) round that is about 1/4 inch (.25 cm) thick. Place a whole almond in the center of each cookie. Bake for about 10 minutes, or until lightly browned around the edges. Remove from oven and transfer to a wire rack to cool completely. Makes about 28 - 2 1/2 inch (6.25 cm) cookies.